Includes childcare, desk space, use of the sewing machines and refreshments, wifi is available. Spaces are limited to up to 6 children (age dependent) and 5-6 creative carers, so please book in advance to ensure a space. We use Eventbrite for tickets and they add administration fees on to the ticket price. Creative Carers Project is a shared studio/work space for creative’s of all disciplines who care for young children. -It is a child welcoming space where the care of your children is supported by childcare ensuring that your children feel safe, by keeping them in close proximity while engaging them in creative play and activities. By welcoming the children into the space they are able to observe your creative process, ask questions and even at times engage themselves. By having the children close by you are able to relax into the creative process of your own practice knowing that they are near, cared for, interacting with other children and that there is someone there to engage them in creative play. 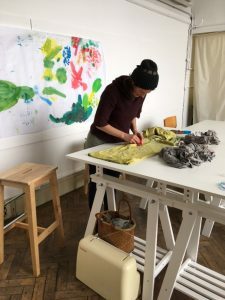 “I often find it hard to focus on my practice within the domestic environment as well as find the time to make use of a studio space. Parenting at times can be a lonely occupation as can being an artist. Ever since leaving art school where the studios were full of ideas and collaborations I have been longing for that community, this project draws creative’s together and re-engages our practice. As carers we don’t have to lay dormant our creativity we just need to support each other with it. This group is for Grandparents, Aunties, Uncles, Dads, Godparents, Au pairs, Childminders, older siblings anyone who cares for young children between the ages of newborn up to 10yrs. It is for designers, illustrators, painters, textiles, writers, performers and freelancers of all disciplines. Each session is £13, which includes childcare, desk space, use of the sewing machines and refreshments, wifi is available. Spaces are limited to up to 6 children (age dependent) and 5-6 creative carers, so please book in advance to ensure a space. We use Eventbrite for ticket admin and they add £1.21 per ticket.